Not sure if it qualifies as an espresso machine! Atomic Sorrentina, green bakelite model, rare & mint condition. The making of an espresso god shot on my Bezzera BZ07 PID. Man, I'm loving this coffee machine. From my own roast of Guatemalan Finca Liquidambar. Not there yet AM, tho Jus surely wishes we were! 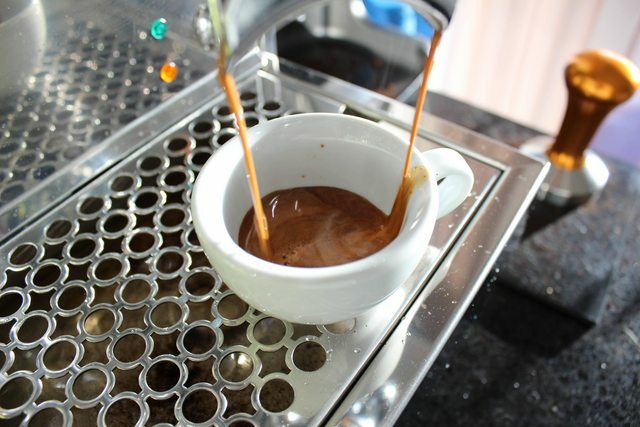 25 seconds of ristretto goodness from the Finca Liquidambar roast. Will be doing more of that this week if the weather fines up. Where did you get the shot timer? Yeah baby!!! now that's a setup! Nice one lemoo! My humble little set up. The baskets hold the cups, beans, milk jugs and accessories. Behind the curtains is the stash of greens. My 2 current coffee producing machines. Some might scoff at the moka pot but my Italian step-mother, who's family has owned the same house for 600 years, uses one daily I use mine for the rare times we get power failures, camping and motels without decent coffee. Not humble, just gloriously compact! I know you all know what it looks like but I have to show it off to someone . Lei a simpaticissima e bellissima! Congratulations... She makes the space! Love it! And the coloured cups. Hope this machine brings you all the joy of caffeine in the world. I posted these pics on my "hello" thread but I thought I'd put some pics here too. Hands Brett a tissue, not the eucalyptus ones either . Thank you GeekKopi, I am sure it will. I am currently having one of the best coffees I have made with a square of Lindt Arabica choccie . The cups are Rockinghams in case anyone was wondering. I should also add a huge thank you to Attilio for organising the shipping of the machine down to Adelaide for me. It is very much appreciated . nice cups. I'll need to get me a set for cuppacinos. I've already got heaps of cups but it's never enough. I have a set of the InCasa face cups, I love them but they are not big enough for me lol. I have a pic of them in the cup thread if interested. He's a bit of a star! mine too!! Latte Art " Photo Gallery"